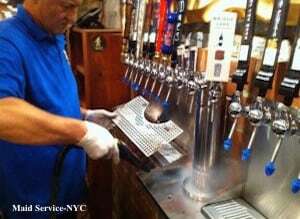 Keeping a bar clean is one of the hardest tasks that any business owner in New York is likely to face. Cleaning in a bar takes a huge amount of time and will usually require staff to stay back way beyond the original finishing time of their shifts to keep it looking clean and welcoming for the next night. If you are finding that cleaning standards or slipping or that the job is simply too big for your team, why not consider improving your bar with the introduction of professional cleaning services from Maid Service-NYC. Our cleaning ladies are just what are needed in any bar in New York that wants to be clean. Cleaning, obviously, takes a lot of time – but it takes the right tools to handle it correctly. With our experts working on the job though, it’s much more likely to find the kind of maid services that you need for your bar as our cleaning ladies can be there pretty much as and when they are required to deal with the job. Presentation and cleanliness play a big part in making a bar appealing to the punters, so if you are using our cleaning ladies it’s much easier than it may have seemed in the past. Any New York bar has to look after itself and the best way to put yourself above the other bars in your area is to keep up the cleaning. Our services can be built around your own needs and requirements, and we will deliver anything any anything that you might need to make your bar look as attractive and as enjoyable as it possibly can be. Our services are all built around one goal; cleaning and cleaning until your bar is spotless every time that we work. Our maid teams and cleaning ladies work relentlessly to get rid of the gunk and the grime to keep your business in the very highest levels of repute with your clients all across the New York area. If you are interested in making your business stand out from the crowd instead of being just another cheap option that people turn to, then cleaning services are so important. You can hire our cleaning ladies whenever you are ready to go, really; you just need to be prepared to get involved with us and we can survey your bars to bring the most effective cleaning possible.